This is where the legend started: on a cassette tape recording from 1982( ….). If you’ve heard Les Morts Vont Vite, you know what to expect. Some people call Univers Zero’s music “the darkest music ever made,” but they’ve obviously never heard any Shub Niggurath. A six-piece ensemble making heavy use of doom-laden fuzz bass guitar and bass trombone, this is a band that uses a truly massive low end to create some of the most imposing stuff you can imagine. I have a hard time choosing between this debut release and the acknowledged classic Les Morts Vont Vite as my favorite effort by this band. There are some striking similarities; most notably, in the inclusion of “Yog Sothoth” on both albums. The version here is just a little more hard-hitting. The real treat, though, is “Barback” . an epic much in the way of “Incipit Tragaedia” on Les Morts, it’s mostly pounding percussion and bass, minimalistic piano playing (with sparsely placed notes chosen for maximum weight), and imposing, tortured guitar solos and trombone bleats on top, along with the occasional haunting female vocals. (Let me emphasize of the trombone here; trombonist Véronique Verdier is a central element of Shub Niggurath’s sound, and a major reason they sound so unique.) Describing this sort of thing is tough, especially if you’re not familiar with this band’s output at all; let’s just say that if you were to take Univers Zero’s rhythm section and amplify it ten times, then put Roger Trigaux’s most extreme Present-style guitar solos into the mix alongside a possessed trombonist, you might have a decent idea of the music here. The two aforementioned lengthy tracks are clearly the centerpieces of this album, but the others are no slouches either. “Entresol” actually kind of grooves, with upbeat, if still imposing, percussion behind a propulsive guitar riff. The trombone playing here sounds almost anthemic, as opposed to the usual creeping-evil style favored by Verdier. Easily the band’s most accessible composition, but in no way does that accessibility come at the expense of depth, or, for that matter, darkness. The closer “In memoriam” is an appropriate comedown from the heights of “Barback,” a grand, slow denouement that’s all spidery guitar and tinkling piano, backed by trombone and as little percussion as necessary to keep things moving. Interestingly, the opening of “In memoriam” foreshadows the opening lines of “Incipit tragaedia,” which would kick off Les Morts Vont Vite. And so the two towering achievements by an unforgettable band are inextricably linked; it’s just too bad that one of them is almost impossible to find. My guess is that it must be the mental-health lobby that’s been keeping this amazing, demented album out of print. In 1986, the French ensemble Shub Niggurath released Les Morts Vont Vite, a slab of dark avant-rock that transported listeners straight through the gates of hell. Combining the visceral drive of rock music with the intellectualism of postwar European classical music, the album became a cult classic. But the vast majority of its fans–to say nothing of the general public–were unaware that Shub Niggurath also created a powerful demo recording back in 1982. Until now, that demo was available only as a lo-fi cassette tape, but French label Soleil Zeuhl has remastered and reissued it as Introduction (available for purchase in the U.S. through Silver Spring’s Wayside Music). The term “demo” is misleading here: Introduction is every bit the accomplished, disturbing force that Les Morts Vont Vite was. Shub Niggurath augments the conventional guitar/bass/drums rock lineup with piano, trombone, and foreboding female vocals and uses an unusual compositional style that shares much in common with other French/Belgian avant-rock chamber ensembles like Univers Zero and Present. The closest Shub Niggurath gets to rock convention is the presence of electrifying guitar solos from axman Frank Fromy, but instead of guitar-hero or hair-metal histrionics, Fromy favors a more tortured brand of noise. Fromy’s vision is well-complemented by the rest of the band. Shub Niggurath’s most distinctive feature is its low end, held down by a combination of thunderous bass and long, doomy trombone notes. The lead track, “Yog Sototh” (which also appears on Les Morts Vont Vite in a slightly different form) is representative of the entire album: Starting with an almost imperceptible drone, the piece soon explodes into a slow bass groove accented by tinkling piano and a soaring, wordless vocal melody doubled by the trombone. The monstrous bass keeps things sinister, and is soon joined by a guitar that screeched like malfunctioning car brakes. By juxtaposing anthemic melodies with dissonant solos, long drones, and insistent bass ostinatos, Shub Niggurath creates a loping beast of an album that is both propulsive and unsettling, rock music that rocks but is never obvious. 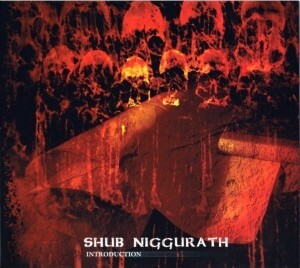 Shub Niggurath’s music, in many ways, ran parallel to doom metal, which was barely in its infancy at the time of Introduction’s recording. 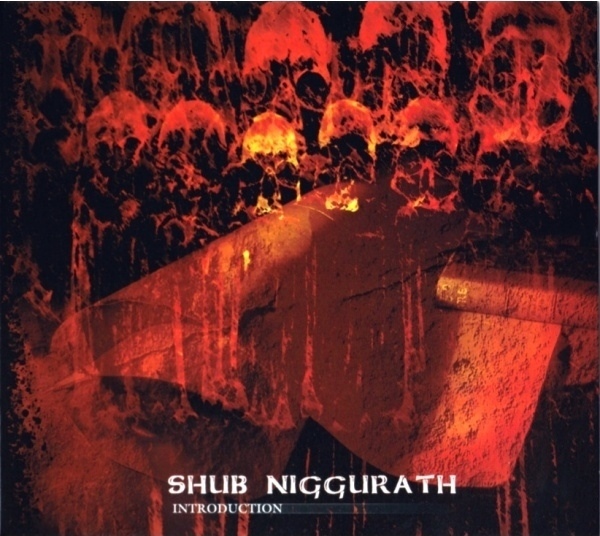 If the history of music had played out a little differently, Shub Niggurath could have kicked off an entire genre of slow, heavy, dark avant-rock, much the way bands like Saint Vitus and Pentagram did for doom. Now lovers of the evil stuff can explore what might have been. Best known for their debut LP Les Morts Vont Vite (later released as a CD on Musea), the recording at hand represents the band in an earlier formative stage, a little over a year after they formed. In The six-piece lineup of bass, drums, guitar, voice, piano / harmonium, trombone and assorted metal percussion recorded this demo cassette in order to help line up dates as they toured. They already have their trademark sound completely ‘together’, even at this earlier juncture. All of the elements are here in bountiful proportions: that dark, creepy and sinister feeling that pervades the compositions, along with sudden changes in dynamics and bizarre, abrasive soundcraft that places disturbing effects on par with the unconventional instrumentation. And the hypnotic voice work of Ann Stewart further amplifies the band’s foreboding perspective. While the influence of Magma, Art Zoyd and Univers Zero are strongly in evidence at various points along these five long tracks, Shub Niggurath took it all several steps further in every direction making them one of the most extreme and uncompromising bands of the mid-80s French avant-garde scene; and while this demo was never intended to be an official release, the music herein stands strong and compelling in every sense. A most welcome reissue. Available previously only as a private cassette release, this Shub Niggurath reissue features the bands very 1982 first recordings. Beautifully re-mastered by Udi Koomran for CD from the original tapes it is an absolute killer! Of all the second-generation French Zeuhl albums perhaps this recording best recreates the savage intensity of Magma’s early period instrumental moments. The two extended pieces, “Yog Sothoth” & “Barback”, by the bands two composers Jean Luc Herve and Frank Fromy, come from out of left field to musically blow the cobwebs out. The album closer, “In Memoriam”, is fittingly titled and works to perfection as a final musical footnote to the album. You will not find more powerful music made by anyone, anywhere than on INTRODUCTION. In fact, it may well be one of the top 5 French albums to have come out of the second wave of the French Zeuhl movement.